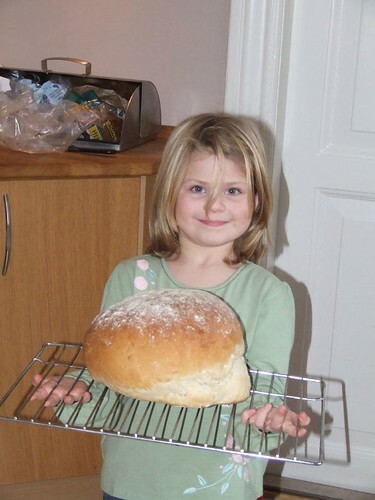 Lotsie likes to bake, a photo by PhylB on Flickr. It started with a crusty loaf. Thomas had spent winter and spring experimenting with roll recipes, with a view to creating little crusty rolls. All his efforts were delicious, but apparently not what he was in search of. He tried spraying them during the baking process with water and that definitely helped but again he was not satisfied. Then one day he found a recipe for creating a bread steam bath. You raise your oven to 250°C but put your bread dough inside a cast iron pot to bake. He decided to try his creation out on Peter (his father) during his last visit. The buzzer went, he opened the oven, extracted the loaf which looked good and was very crusty, he went to close the oven door when he noticed the pin that closes the oven door had melted! We had a lovely loaf but it had destroyed a £1200 oven in the process - hmmm, I'm not sure any loaf is worth that much! I asked Thomas where we'd bought it - appliances online, so figured that was a good starting point. I asked if they stocked new door pins and after putting me on and off hold, they asked if they could transfer me to Belling Customer Services. Again, I went through my story of an oven that melts at oven temperature and they hummed and hawed before asking to put me through to their parts department. Twenty minutes in and I was explaining the issue for the third time to a friendly Liverpudlian woman - ho hum... She agreed that it shouldn't melt at that temperature but given my lack of warranty, she would offer to sell me a new door. Losing the will to live, I decided to find out the price of the new door before going ballistic or asking to speak to her supervisor - I really couldn't face the story again. I was put on hold and forced to listen to some more annoying music. She came back with a new bombshell. My cooker was still current but they had discontinued stainless steel because they couldn't source the raw materials and as usual with today's short-sightedness they didn't stock spares. She asked to transfer me to the department that offered current, dissatisfied customers heavily discounted new cookers. One hour in and I was still on to Liverpool. The woman from the replacement sales department asked my name, address and as she asked my telephone number, what do you know - we got cut off! Incandescent with rage, I waited five minutes, calming down before starting back at square one - appliances direct. I got through to Liverpool once again to a bloke called Paul. I explained I was on to a woman who was about to offer me a discounted cooker when we'd been mysteriously cut off. Paul sounded surprised. He explained the woman was a new employee and had the wrong end of the stick. On the verge of ranting, I was stopped in my tracks when Paul explained that, yes that was their normal policy but in just this one case, where they had discontinued a model eighteen months ago because they couldn't get the raw materials, they had been offering current customers a different solution. Because they were at fault, they were offering to refit all the panels on the stainless steal cookers with black, free of charge. I shut up and became pleasant to my new hero, Paul! Paul ordered me two new oven doors, a new grill door, a new slow cooker door, a control panel fascia, and a new surround for my hob. Given my original gripe was about the cooker being rusty, this was going to solve that problem as well as fixing my newly broken oven door. He then offered me a free engineer to fit the lot on the morning of August 15, apologizing profusely that he couldn't do it earlier as two of the doors were out of stock. The following day a package containing the fascia, two door exteriors, two door interiors, and the hob panels arrived with FED EX. I couldn't believe my eyes - I had had a sneaking suspicion the deal I'd stuck with Paul outside warranty had been too good to be true, but no, he'd actually sent the parts, free of charge. Then on the morning of July 5, I was wakened at 8am with my phoning ringing. I couldn't find it. With both my parents ill, I can't leave a phone to ring so I dashed to listen to the voicemail... Hello this is Robert from Belling, I'll be with you in an hour. Huh? Robert arrived and I pointed out we didn't yet have all the parts and we'd been told he was coming a month later! He thought I was a stupid woman who had no idea what I was talking about so emptied all the boxes holed up in my garage. He then pointed out I was two doors short and asked if I wanted him just to fit a new inner door so I could use it while the two doors were re-ordered... With all the packaging open anyway, he made a quick check and announced that I'd been sent the wrong control panel fascia. Mine needed twelve holes for buttons, the one I'd been sent had only eleven. He promised to sort that out with head office. He left and Thomas and I took the kids to the beach for two hours. On my return I ran into the FED EX guy again. He was delivering the missing doors. That was quick. That was too quick. The original missing doors were being delivered two hours too late to be fitted. Meanwhile Robert had left several messages on my voicemail. Message one - They don't do that fascia any more, you're going to have to kick up a fuss to get a new cooker. Message two - I've managed to find an old fascia in stock, it's sorted but I can't fit it for two weeks. Now with all the missing parts except the fascia in my garage, I was ready for Robert. Wednesday I opened my door to go to B&Q and walked straight into Mr FED EX again. What on earth are you building, missus? he asked, handing me the replacement doors Robert had ordered express-delivery the day before. No extended warranty and now I had no fewer than six door outers and five door inners in my garage! The following day my friend from FED EX brought my replacement fascia. Call me sceptical but I decided to check it, just in case. What do you know? It had eleven holes in it. I spent the next 50 minutes onto Tanya from Liverpool who kept asking if I could be put on hold while she read my notes. Eventually, exasperated she told me Jake would bring me the fascia himself next week when he was sent round to fit all my new parts. I can hardly wait for the next instalment. If I was a betting person, I'd probably put my house on Jake not bringing the correct fascia next week, but on a more positive note - I may soon be able to sell enough spare Belling cooker parts on ebay to be able to afford a brand new cooker!